We had a call from Guy Fawkes, not the person, the promotions company. 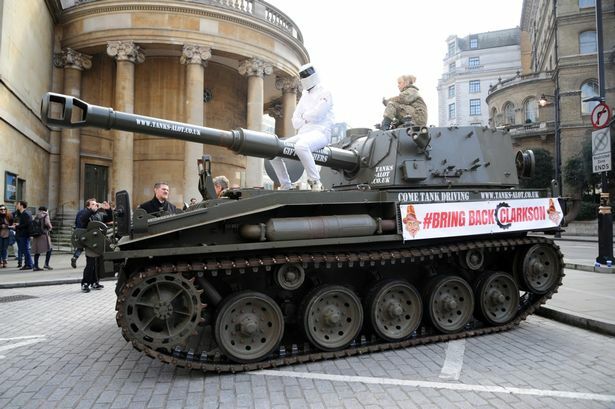 Seemed they wanted to make a statement with massive impact in an attempt to save the Stig and the gangs’ jobs! 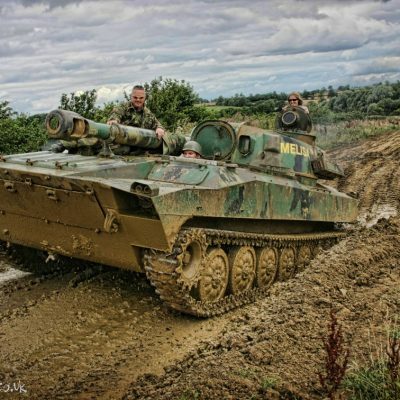 That’s easy, do it in a tank! 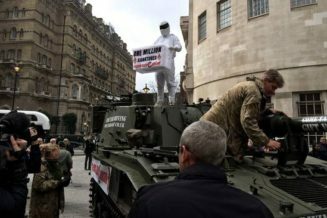 Of course given that Mr Clarkson had already dished out a few slaps to a colleague, all over a corned beef sandwich after 18 hours of filming, saving his skin was never going to be straightforward. No doubt the corned beef originated from Argentina and karma always finds a way to even the score. Fans will remember one particular episode in which the lads managed to upset just about everyone in the country in question. To cut a long story short, we got the booking and we just happen to keep a Tank hidden in London so we were ready for action in a matter of hours. 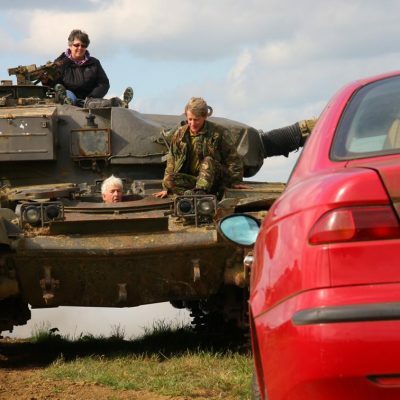 This job needed Tank Nut Dave’s navigation skills and diplomacy, Jill’s police calming and picnic making qualities and my great hair and urban tank driving experience. The day went like clockwork but if the truth be told more like cuckoo clockwork. 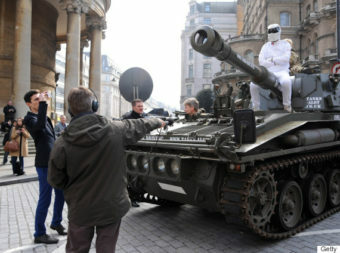 We arrived with the Stig a tad late so this just added suspense which allowed for even more press to turn up. 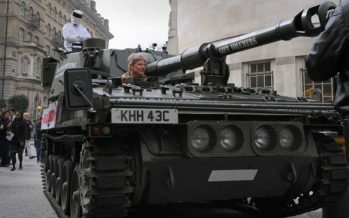 We met lots of celebs, took a booking or two then chugged on to the Embankment and had a superb picnic on the tank turret while parked next to the Thames reflecting on the day’s events. I have just one regret and it’s a big one. 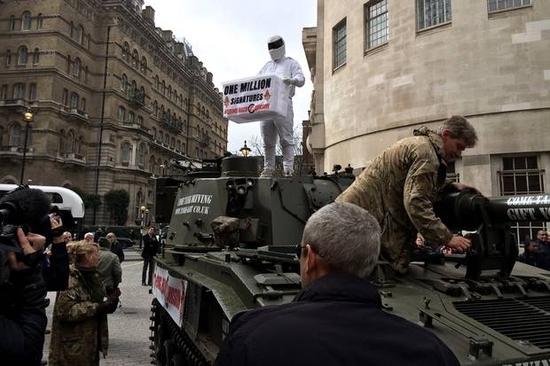 I will never forgive myself for not taking the opportunity to yank the Stig’s joggers down while he had both hands full of a rather large petition! Jill and I were in the perfect position on the tank and this was really too good to turn down. 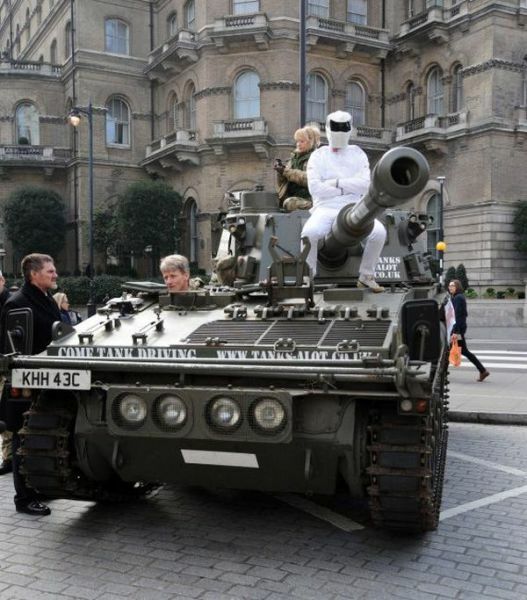 I really did want to reveal the Stig in a way that most people hadn’t thought of. I will always wonder if he goes commando or not. 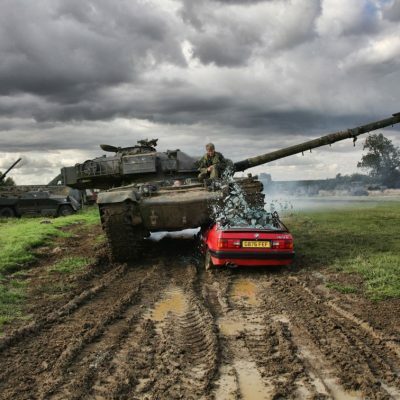 Soon after the show was axed Stig turned up and confessed he never really liked cars but loved tanks. Having failed his army medical he has worked at Tanksalot since. By the way, the reason he didn’t speak on the show was that no one can make heads or tails of his Polish accent!